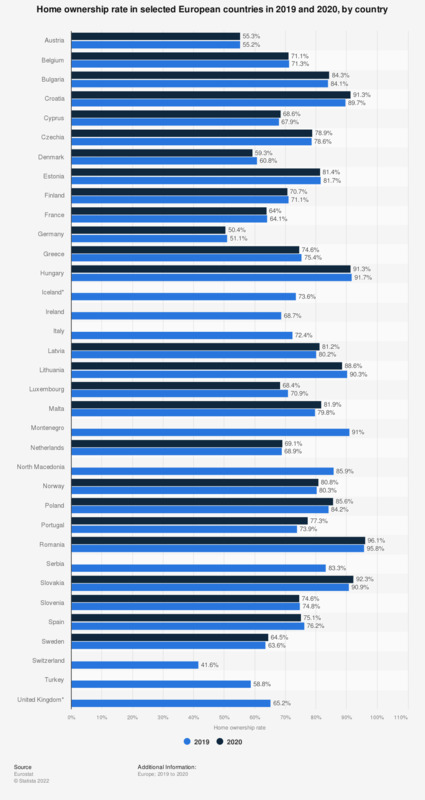 The statistic shows the home ownership rate in selected European countries in 2017. The home ownership rate is the share of owner-occupied dwellings of all homes. The home ownership rate in the presented European countries extended from 51.4 percent in Germany to as much as 96.8 percent in Romania. More developed European countries, such as France or Germany, tended to have a lower home ownership rate compared to the frontier countries, such as Lithuania or Slovakia. The share of house owners among the population of all 28 European countries has remained relatively stable over the past few years, amounting to approximately 69 percent. * Break in time series (2015 data). Everything On "Home purchasing in the United Kingdom (UK)" in One Document: Edited and Divided into Handy Chapters. Including Detailed References. Do you own or rent your home (primary place of residence)?